The lake below this peak is Loch Coimín Piast, 'lake of the little hollow of serpents'. Like many another Irish mountain lake, there was probably a story of a water-monster associated with it which has now been lost. In December 1943 an American Dakota aircraft crashed into the slopes of Cnoc na Péiste just above the lake. Pieces of the aircraft are still visible. A plaque here commemorates the 5 victims and there is another plaque at Cronin's Yard (Jim Ryan, Carrauntoohil and MacGillycuddy's Reeks, 80-81). 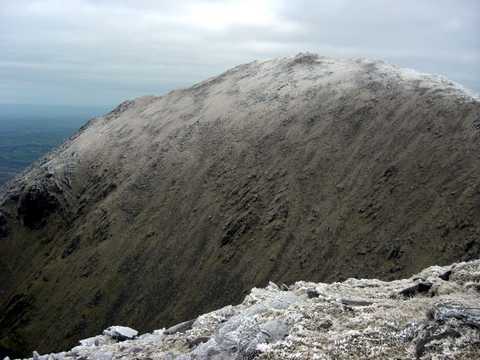 Cnoc na Péiste is the 4th highest place in Ireland.